JOURNEY TO OUR NEW HOME IN NEW YORK. All things having been prepared for our departure our last “Good-bye” spoken, and our last look taken of the old plantation, we started, amid the sobs and prolonged cries of separating families, in company with our master, the overseer and another white man named Davis, who went with us to take back the five-horse “Pennsylvania team,” which was provided for the conveyance of the food for the slaves, and what little baggage they might have, and also that of the overseer. Capt. Helm had determined to leave his family until he could get his slaves settled in their future quarters, and a home provided for himself, when they were expected to join him. We traveled northward, through Maryland, Pennsylvania, and a portion of New York, to Sodus Bay, where we halted for some time. We made about twenty miles per day, camping out every night, and reached that place after a march of twenty days. Every morning the overseer called the roll, when every slave must answer to his or her name, felling to the ground with his cowhide, any delinquent who failed to speak out in quick time. After the roll had been called, and our scanty breakfast eaten, we marched on again, our company presenting the appearance of some numerous caravan crossing the desert of Sahara. When we pitched our tents for the night, the slaves must immediately set about cooking not their supper only, but their breakfast, so as to be ready to start early the next morning, when the tents were struck; and we proceeded on our journey in this way to the end. At Sodus Bay there was then one small tavern, kept by a man named Sill. The bay is ten miles in length and from a half to two miles in breadth, and makes an excellent harbor. The surrounding country then was almost an unbroken wilderness. After Capt. Helm had rested a few days at Sodus, he went six miles up the bay and purchased a large tract of land lying on both sides of that beautiful sheet of water, and put his slaves on to clear and cultivate it. Then came the “tug of war.” Neither the overseer nor the slaves had the least knowledge of clearing land, and that was the first thing to be done. It was useless to consult the Captain, for he knew still less about matters of that kind. To obviate this difficulty, our master bought out a Mr. Cummings, who had some cleared land on the west side of the bay. On this he put the overseer and a part of the slaves, and then hired a Mr. Herrington to take charge of the remainder. Herrington and his gang of slaves was sent to the east side to chop down the heavy timber and clear the land for cultivation, all of which had first to be learned, for we knew nothing of felling trees, and the poor slaves had rather a hard time of it. Provisions were scarce and could not be procured for cash in that section. There was no corn to be had, and we had but little left. We had no neighbors to assist us in this trying time, and we came near starvation. True, the wild, romantic region in which we were located abounded in game, – elk, deer, bear, panther, and wolves, roamed abroad through the dense forest, in great abundance, but the business of the slaves was not hunting or fishing, but clearing the land, preparatory to raising crops of grain the coming season. At last Capt. Helm chartered a boat, and manned it to go to the mouth of the Genesee River to buy corn. They embarked under favorable auspices, but soon there came on such a tremendous storm, that the boat could no longer be managed, and the crew in despair threw themselves on the bottom of the boat to await their inevitable destruction, when one of their number, a colored man named Dunbar, sprang to the helm, and with great difficulty succeeded in running her safely into a Canadian port, where they were obliged to part with every thing in their possession to obtain the means to return to their families in Sodus, who had given them up as lost. But, to the great joy of all, they came back at last with their lives, but with nothing for the famishing slaves. Before another boat could be sent for our relief, we were reduced to the last extremity. We became so weak we could not work, and it was difficult to drag ourselves about, as we were now obliged to do, to gather up all the old bones we could find, break them up fine and then boil them; which made a sort of broth sufficient barely to sustain life. This we drank, and merely existed, until at last, the long looked for boat returned, loaded with provisions, which saved us from starvation and gave us strength to pursue our labor. About this time two slaves who were laboring in the forest, instead of returning to their cabin as was expected, got lost, and wandered eight days in the dense forest without provision, except what they could procure from roots and the bark of trees. Great exertion was made to find them; guns were fired, horns blown, and shouts raised, but all to no purpose. Finally, we gave them up, supposing they had starved to death or had been killed by wild beasts. One of them was an elderly man, named Benjamin Bristol, and the other, Edmund Watkins, a lad of about eighteen years of age. They wandered in an easterly direction, a distance of some sixty or seventy miles, through an unbroken wilderness, vainly trying to find their way home. On the eighth day, to their inexpressible joy, they came out on the shore of Lake Ontario, near Oswego; but young Watkins was so completely exhausted that he declared himself incapable of further exertion, and begged to be left to his fate. Bristol, however, who chewed tobacco, which it was supposed kept him from sinking so low as his companion, took him on his back, and carried him home, which they reached in a famished state and reduced to skeletons. All were thankful for the preservation of their lives, and, with the best we could do for them, they soon recruited and became strong as ever. One day, two others and myself thought we saw some animal swimming across the bay. We got a boat and went out to see what it was. After rowing for some time we came near enough to perceive it was a large bear. Those who watched us from the shore expected to see our boat upset, and all on board drowned, but it was not so to be; the bear was struck on the nose with a blow that killed him instantly, and he was hauled ashore in great triumph. While these things were transpiring on the east side of the bay, the overseer on the west side determined to punish one of the slaves who worked on the east side. The name of the slave was Williams; a strong, athletic man, and generally a good workman, but he had unfortunately offended the overseer, for which nothing could appease his wrath but the privilege of flogging him. The slave, however, thought as he was no longer in Virginia, he would not submit to such chastisement, and the overseer was obliged to content himself with threatening what he would do if he caught him on the west side of the bay. 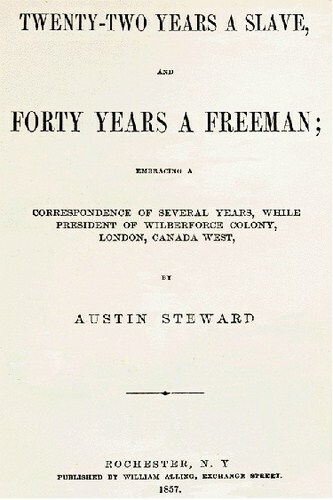 A short time after, the overseer called at the cabin of one of the slaves, and was not a little surprised to find there the refractory slave, Williams, in company with three other men. He immediately walked up to him and asked him some question, to which Williams made no reply. Attended, as he always was, by his ferocious bull-dog, he flourished his cowhide in great wrath and demanded an instant reply, but he received none, whereupon he struck the slave a blow with the cowhide. 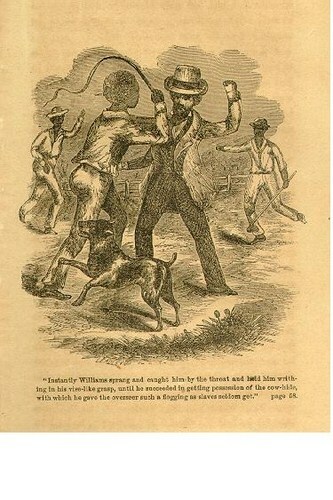 Instantly Williams sprang and caught him by the throat and held him writhing in his viselike grasp, until he succeeded in getting possession of the cowhide, with which he gave the overseer such a flogging as slaves seldom get. Williams was seized at once by the dog who endeavored to defend his brutal master, but the other slaves came to the rescue, and threw the dog into a huge fire which was near by, from which, after a singeing, he ran off, howling worse than his master when in the hands of Williams. He foamed and swore and still the blows descended; then he commanded the slaves to assist him, but as none obeyed, he commenced begging in the most humble manner, and at last entreated them as “gentlemen” to spare him; but all to no purpose. When Williams thought he had thrashed him sufficiently, he let him go and hurried to his boat and rowed down the bay, instead of crossing it. The overseer no sooner found himself at liberty than he ran out, calling to a servant girl to bring his rifle, which was loaded. The rifle was brought, but before he could get to the bay, Williams had gone beyond his reach; but unfortunately another boat was at this moment crossing the bay, which he, mad with rage, fired into. The men in the boat immediately cried out to him not to repeat the shot, but he was so angry that he swore he would shoot somebody, and sent another bullet after them. No one was hurt, however, but the brave overseer was vanquished. Crest-fallen and unrevenged, he shortly after called on Capt. 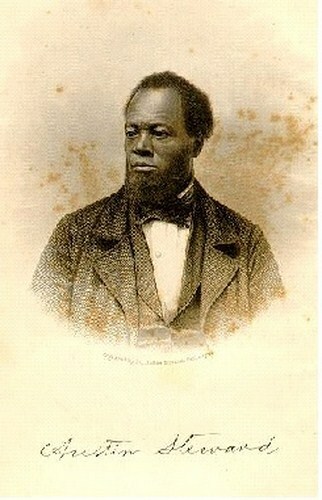 Helm for a settlement, which was granted, and bidding a final adieu to the “Genesee Country,” he departed for Virginia, where he could beat slaves without himself receiving a cowhiding. No one regretted his absence, nor do I think any but the most heartless would cordially welcome his return to the land of Slavery. REMOVAL FROM SODUS TO BATH. Helm went to Virginia for his family, and returning with them, concluded to locate his future residence in the village of Bath, Steuben County. He purchased a large tract of land near the village, a large grist mill, and two saw mills; also, two farms; one called the “Maringo,” east of the village; end the other, called “Epsam,” north of it; and a fine house and lot in the village. He also kept a distillery, which in those days was well patronized, for nearly every body drank whisky; and with Capt. Helm it was a favorite beverage. The slaves were removed to Bath, where our master was well suited, and was everywhere noted for his hospitality. He had a great deal of land to cultivate, and carried on a multiplicity of business.